A beautiful ornate wreath of flowers and plants is a touching tribute to loved ones and a caring way to send your condolences and pay your respects when saying farewell to those who have passed away. This timeless tribute is an elegant way to pay your respects and are available in a variety of sizes, suitable for both adult and child caskets. Of the varied kinds of funeral flower arrangements, funeral wreaths are the most popular. The classic circular design is extremely versatile, and can be made to any size, girth, and we can use a variety of materials for both the decoration and the frame. If you would like to place a candle or lantern within the centre of your wreath, or even a photograph of the deceased, we will build the wreath around the size of the item to frame it. In addition to flowers, we can discuss ribbons and other materials that can enhance the design and add a hint of personality to the arrangement. In Christian ceremonies evergreen wreaths are more appropriate, as they have been used for centuries to represent the victory of the soul over death. However, flowers themselves also represent life and resurrection. While there is a long tradition behind funeral wreaths, most people now simply use the colours and flowers that their loved one preferred. 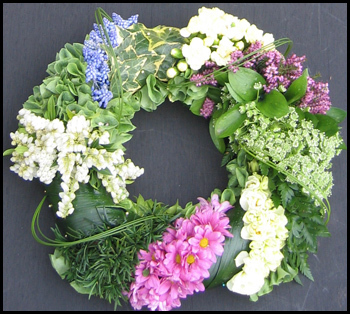 Throughout history it was believed that the funeral wreaths’ circular shape symbolizes eternal life. Wreaths are also attached to an easel and are often placed at the service, and sometimes moved to the grave site. First Impression offer a wide range of funeral wreaths however you can also have an arrangement custom made. Our expert florists use their knowledge, experience, and creativity to mix and match varied flowers to brighten up the occasion. Let us help you give some support to your loved ones during such difficult times. Send them our beautifully designed funeral wreaths to express your compassion, gratitude, and sympathy for their loss.